Book Corner: Interview with Archaeologist and Author James Wright – History… the interesting bits! We have a special treat at History the Interesting Bits today and it is a privilege to welcome archaeologist James Wright to the blog. I have been watching the progress in recent years, of the excavators of the royal palace at King’s Christine Clipstone, through Jane’s Wright’s Facebook page, History & Archaeology of Kings Clipstone. 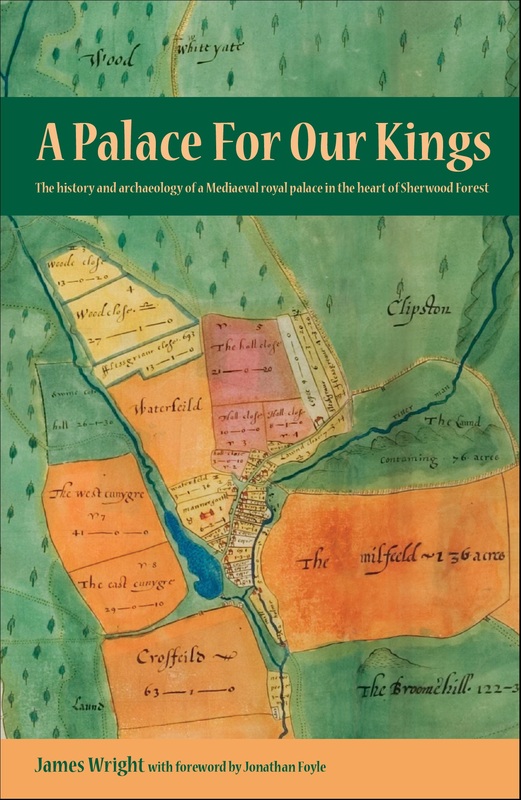 James is also the author of A Palace For Our Kings, a fabulous book which traces the history and archaeology of the Kings Houses of Clipstone in Nottinghamshire; a royal palace, since the time of Henry II, in the heart of Sherwood Forest. James talks to me about the book, the palace, his career and archaeology. I was very young. Maybe five or six. I saw a film set during the Second World War and couldn’t believe that something so exciting was based on reality. I talked to both of my grandfathers about their experiences. I was instantly hooked on history and used to visit my local library and took out all of their history books – and not just the ones written for kids either! Later my parents started taking me to visit castles and monasteries and great houses. At high school and college I had a really good history teacher called Nick Shorthouse who really guided my interest. Archaeology became my inevitable career choice as I translated from hobby to study to profession. Do you get to spend a lot of time doing practical archaeology, or is most of it study-based? I am a buildings archaeologist and historic stone specialist at the Museum of London Archaeology. A good portion of my time is spent in the field recording historic buildings. I still occasionally get involved in excavations, the last one being a small trench at the Tower of London which I dug last year. In truth I consider all research to be practical archaeology. I studied under Philip Dixon at the University of Nottingham. He taught us to “always use all of the tools in the toolkit.” I see documentary research, historiography and contextual history to be every bit as important in the study of archaeology as fieldwalking, geophysics, topographical survey and excavation. It’s all evidence! What do you love best about being an archaeologist? The exciting opportunity to unravel the hidden stories of real people – often for the first time in history. What don’t you like about being an archaeologist? What is your greatest archaeological find? When I was a field archaeologist I was lucky enough to excavate an intact Early Neolithic cup in the Trent Valley that was perhaps 6,000 years old. The most significant discovery that I have made in a building was a dense distribution of ritual protection marks carved by carpenters at the great house at Knole, Kent, in reaction to the ongoing political propaganda in the aftermath of the Gunpowder Plot. You can read all about it in Maev Kennedy’s article published in The Guardian. What is the nature of your research at Clipstone? I’ve been researching the Mediaeval royal palace at Kings Clipstone– known at the King’s Houses – in the heart of Sherwood Forest since 2004. The site was used by eight Plantagenet monarchs from Henry II to Richard II. They built one of the very largest residences in Mediaeval England that stretched across approximately 7.5 acres and had an enormous deer park lying to the west. Much of the research work has been conducted ad hoc and, in many cases, has been carried out in conjunction with other organisations or researchers. In many respects I’m following up the work of antiquarians, historians, archaeologists and the local community who have been looking at the site since the late seventeenth century! 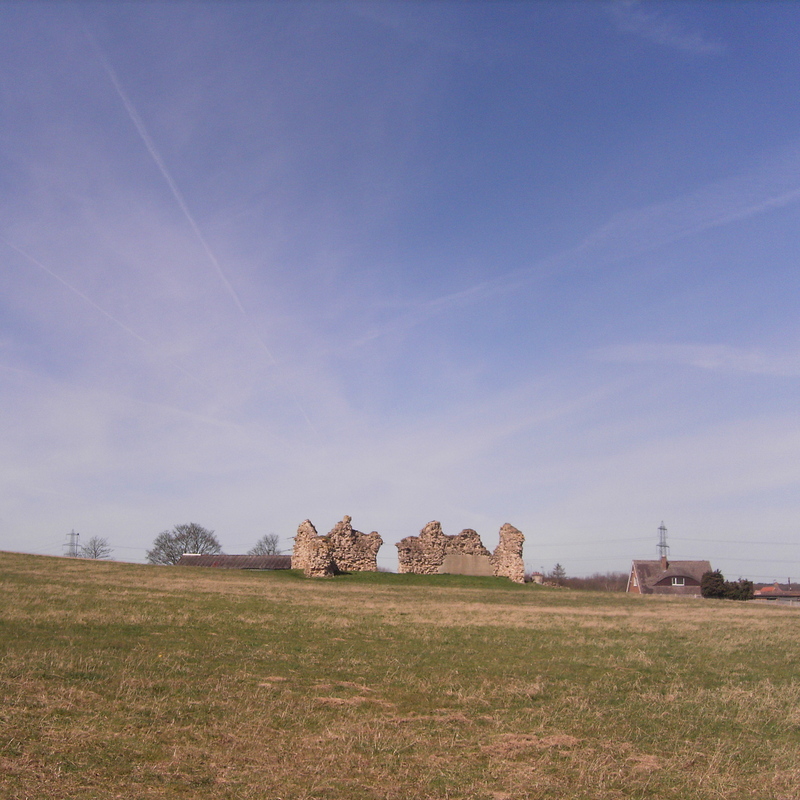 I first visited Clipstone during the opening stages of a project looking at castles in the county of Nottinghamshire. The King’s Houses was never a fortified residence so I was not able to bring the site into the scope of that project. However the passion and enthusiasm of the landowners – Martin and Mickie Bradley – was infectious. The last surviving building (once just one of a very great number) that stands in splendid isolation on its hilltop in Sherwood Forest is known as King John’s Palace. It is a very dramatic structure but, by 2004, it was in a very critical state of disrepair. It had been standing for almost 850 years by that point. I became deeply involved with a campaign to conserve the building. English Heritage (now Historic England) stumped up £100,000 to save this nationally significant grade II listed building and scheduled ancient monument in 2009. Paul Mendham Stonemasons undertook the work. It was a great relief, however my determination to better understand the archaeology and history of the site was only just beginning…. Many of England’s kings have stayed at Clipstone, from Henry II onwards, was it always for hunting in Sherwood Forest? Hunting played a very important part in the decisions of eight Plantagenet monarchs to visit Clipstone. If we look at the reign of Edward II who visited the site on broadly seven occasions, five of those stays directly related to the hunting seasons of particular species of deer. Excavation has yielded the bones of roe, fallow and red deer which were all consumed at the palace. The deer park, surrounded by its timber pale fence, was around seven miles in circumference and enclosed approximately 1500 acres. Hunting was an important status activity for the kings and acted as a mechanism for social bonding and training in martial skills as well as food provision. However the palace at Clipstone also acted as a backdrop for important state occasions. It was a location for the governance of the kingdom, a place where jousts were held, somewhere to host weddings, an estate that provided food for the royal household. Inside the buildings the visitors would be accommodated in chambers and would feast in the great hall whilst being entertained by musicians, storytellers and poets. Edward II and Isabella of France conceived their son John of Eltham at the palace. These were architecturally very diverse places and were conceptually and physically used in many ways. Clipstone is a long way from London, surely its historical significance is limited? The palace is approximately 150 miles from London. However, when the site was first built in the mid-twelfth century, London was not the dominant centre of government that it became in the later Mediaeval period. Kings moved constantly around the country dispensing justice, visiting allies, conducting war, hunts and tournaments or engaging in ritual and religion. Many of their residences were located in the royal forests to take advantage of the remote game reserves which were used in a manner akin to the modern high status hotel with attached golf course – the palace and deer park were as much for business as pleasure. We can see this through Richard I’s meeting at Clipstone with the king of Scotland in 1194 or Edward I’s decision to hold parliament there in 1290. What was your most exciting discovery at Clipstone? The discovery of a very large part of the palace gatehouse and adjacent boundary wall that still survives up to first floor height within the later buildings of three post-Mediaeval cottages in the village. The archaeological impact of that find was spectacular enough, but pinning down the gatehouse also enabled me to understand how the rest of the palace was laid out as it proved to be pivotal in interpreting a fourteenth century documentary description of the palace buildings. Once I knew where the gatehouse was, I was able to work out its relationship to various chamber blocks, the stables, the three kitchens, the royal apartments, the great chamber and great hall. This was all done with the help of my friend and colleague Richard Reeves who translated the documents, held at the National Archives, from the Mediaeval Latin and Middle English. Your book highlights how the King’s Houses played their part in English medieval history, did it surprise you to find out how popular it was with medieval monarchs? I wanted to look at the deeper questions that others had not previously asked. It was known that Henry II spent a lot of money developing the palace in 1176-80. I wanted to know why he chose Clipstone and discovered that it was originally conceived by Henry as a physical statement of the power of his absolute monarchy in the aftermath of a civil war. Then I started interrogating further data and realised that Henry III ordered bars to be added to the windows in the royal apartments as added security after an assassination attempt; that Edward I ordered the construction of a massive stable for two hundred horses during a period where he was moving tens of thousands of troops into the Welsh wars; that Edward III held a morale-boosting tournament there after a setback in the wars in Scotland; or that Richard II visited in 1387 to relax after a particularly tough period of infighting with his own royal council. The more I read and researched, the more I realised that this was one of the most important and significant royal residences between the mid-twelfth and mid-fifteenth centuries. The stories that I have uncovered have demonstrated that almost the entire history of England can be told through the focused lens of this one site as a result of the importance placed on it by the kings. Most archaeological projects don’t seem to get their own books. What made you decide to write the book? All archaeological fieldwork must be written up and disseminated. It’s an absolute basic requirement. There is simply no point in doing archaeology if you do not tell people what you have done. Whether that be a complete grey literature site report or a published book, it is fundamentally important to release the information. I chose to write this book because after working at Clipstone for over twelve years I have decided to put into print everything that I have learned about this enormously important site. Essentially the book is my swan song and will leave a solid legacy of my work in the public domain. Thank you James, I think its fabulous that your research has been made available to the wider public with this book. Very much so – the proof of that is that I spent eleven hours working on the book on Christmas Day 2015! What I found most compelling was that stories kept finding themselves. There is a constant theme running through the book which looks at how the ordinary people of Kings Clipstone reacted to, dealt with and coped with the presence of the royal palace, the forest laws and a continuing tension between their common rights and the will of the monarchs. It wasn’t always a harmonious relationship and there were definite flashpoints. The book is dedicated to a fourteenth century common rights activist called Robert de Clipstone who fought for his community against both Edward II and Edward III and eventually won his case! Is there more to find out about the King’s Houses? Of course! My book simply records everything that I have personally learned over the last twelve years, set alongside the work of previous researchers, and against the wider context of historical events. I hope that the ongoing excavations by Mercian Archaeological Services at the palace site will eventually yield fully developed archaeological reports in the very near future. In the meantime the focus of research is starting to shift towards a site three miles across the deer park as Forest Town Nature Conservation Group and MB Archaeology look at aspects of a fortification and agricultural community known as Clipstone Peel which was established in the early fourteenth century by Edward II. My part in the story of Clipstone is over, but there are new people asking new questions and I wish them very well! Currently I am in the process of writing up another major phase of building survey for the National Trust at Knole. I’m also working on the finishing touches of a report for the Museum of London about the very mysterious London Stone which was made famous by Shakespeare when he depicted the rebel Jack Cade touching his sword on it and claiming the city in 1450. A Palace For Our Kings is out now as a limited edition paperback and e-book via Triskele Publishing. More information on the book and Kings Clipstone project can be found on social media: Facebook and Twitter. A huge ‘thank you’ to James Wright for taking the time to answer my many questions, it has been an absolute pleasure. Look out for my review of James’ book A Palace For Our Kings tomorrow! I had never heard of Clipstone, brilliant interview and will read up more about it. Thanks for sharing this. I love archaeology. It’s another book for the TBR list. Cheers! It is now on my reading list. I am interested in archeology so it should prove interesting. Thank You.